Jack Pemba, CEO Pemba Group of Companies, earlier today, met Ambassador of the Republic of Uganda to United States of America (USA) Mull Sebujja Katende and Deputy Head of Mission Santa Mary Laker Kinyera at their base in Washington DC, USA. The primary objective of Pemba’s visit was to first and foremost declare and then discuss the interest by potential investors into the Ugandan market shown by the three high caliber personalities during a meeting at the Washington DC Senate last week. The dignitaries included; Peter Anderson Sessions, an American Republican politician from Texas, former Congressman from Texas, chairman of House of Rules Committee and former chairman House of National Republican Congressional Committee. The other two at the Senate were Theodore Scott Yoho, a US representative for Florida’s Third Congressional District and politician Kim Jin Pyo of the Democratic Party of Korea and a member of the National Assembly of the Republic of Korea, chairman Korea National Economic Advisory Council, chairman Korea National Assembly Prayer Breakfast and chairman President Moon JAE-IN’S Transition Committee. The prospective investors identified Uganda as one of the leading investment opportunity countries in Africa at the moment and Pemba took it upon himself to initiate and lay groundwork for the American and Korean bigwigs. 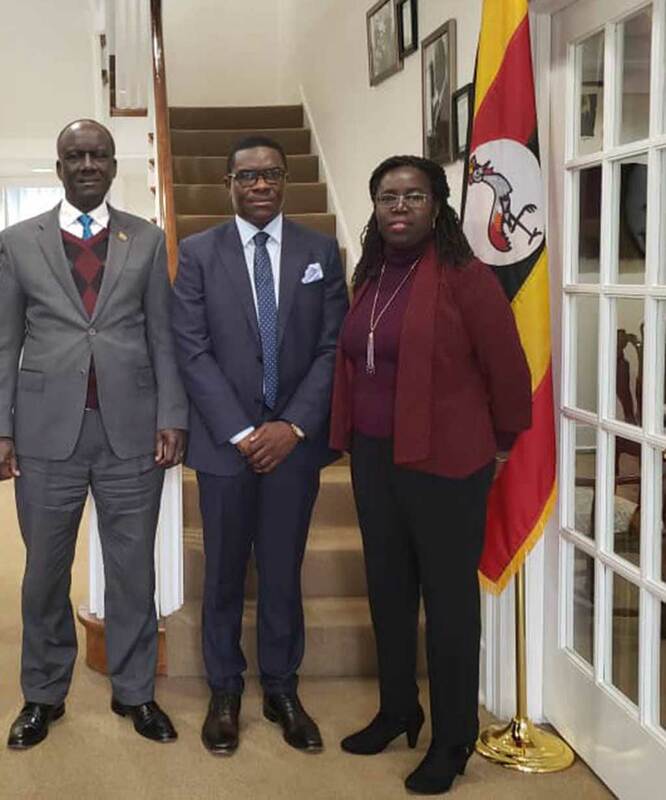 Pemba was wowed by the reception accorded to him by Katende and Kinyera at the Ugandan Embassy in Washington as he brainstormed with his hosts on the looming investment opportunity. Jack Pemba,CEO Pemba group of companies (C)with Ssebujja Katende (L) Uganda’s Ambassador to USA and Deputy Head of Mission Santa Mary Laker Kinyera. Courtesy photo. The two Ugandan diplomats vowed to do everything possible in their means to see that Pemba’s dream to grow Uganda’s Gross Domestic Product (GDP) escalates two-fold. Katende and Kinyera, whose key tasks are to focus on commercial and economic diplomacy and, in particular, attraction of investments into Uganda, sourcing of markets for Ugandan products and promotion of Uganda’s tourism sector, welcomed Pemba’s voluntary and tireless efforts to promote Uganda and referred to him as an unsung hero. The Ambassadors showed their gratitude and humility by serving the amiable and grateful Pemba a specially made warm cup of Ugandan Coffee. “I have a beautiful experience from investing in Uganda,” said Pemba. “Uganda is magnificent and full of vibrant resources. That’s why I personally stated investing into the country. It is for the same reason that I have taken it upon myself to encourage other interested potential investors to come to Uganda and grow their fortunes. “Their presence in Uganda will create jobs for the natives and will also help them develop the country and thus growing the business empires as they make profits as individuals. It will be a win-win situation,” Pemba told the Ambassadors about the Pearl of Africa as he wrapped up his visit to their Washington DC base in USA.